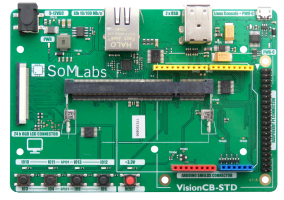 VisionCB-6ULL-STD is a carrier board for the VisionSOM family of computer-on-modules which are powered by NXP i.MX 6UL or i.MX 6ULL application processors (ARM Cortex-A7). A carrier board, together with a System on Module (SoM), makes a complete development platform similar to SBC. The carrier board houses the most common interfaces such as USB, Ethernet, UART, etc. A large variety of interfaces allows to use it as both a complete development platform or as a stand-alone end-product. This page was last modified on 27 December 2018, at 17:55.